Prosecutors seeking the death penalty against Dzhokhar Tsarnaev have depicted him as part of a disturbing global movement, the rise of “lone-wolf” terrorists. They argue that the 21-year-old Cambridge man showed the tell-tale signs: a fascination with jihadist material on the Internet and a preference to work alone, or in a small group. But the government’s portrayal of Tsarnaev as a lone wolf also opens up an opportunity for the defense, which began its case Monday, as it seeks to illustrate how Tsarnaev was troubled and easily influenced by others — particularly his older brother. Studies show that these attackers are often emotionally vulnerable individuals who can be converted to a new cause rather quickly, terrorism experts say. “Terrorists express a political aim, otherwise they aren’t terrorists. But that aim doesn’t mean it’s driving their behavior,” said Max Abrahms, a political science professor at Northeastern University who studies terrorism. Liah Greenfeld, a Boston University professor who specializes in nationalism and modern culture, said that she sees a desperate personal crisis in many lone-wolf terrorists, and believes their deadly missions are often meant, often unconsciously, to target themselves. “Very often these lone wolves cannot commit suicide, they commit suicide by cop,” she said. A look at the witnesses, evidence, and key players in the trial. Notable lone-wolf attackers include Ted Kaczynski, the reclusive Harvard-educated Unabomber who killed three as he railed against technology starting in the late 1970s; Timothy McVeigh, who killed 168 people in the Oklahoma City bombing in 1995 to express his antigovernment rage; and US Army psychiatrist and Muslim extremist Nidal Malik Hasan who killed 13 people during a shooting rampage at Fort Hood, Texas, in 2009. Most recently, in December authorities released the lengthy mental health history of Man Haron Monis, a gunman who took hostages in a cafe in Sydney, which ended with three dead, including Monis. Assessing the degree of political and personal motivation behind lone-wolf terrorists is important for government officials as they try to come up with prevention programs to halt the alarming growth of this type of violence. But it also has implications in Tsarnaev’s death penalty trial, as the defense and prosecution portray Tsarnaev’s interest in radical Islam in vastly different lights. The defense has emphasized personal and psychological factors behind Tsarnaev’s newfound ideological fervor, such as his jihadist scrawlings in a Watertown boat. The defense has also portrayed Tsarnaev’s older brother as the classic ideological lone wolf who pulled in a troubled younger brother, while the prosecution has cast Tsarnaev as a calculated jihadist partner who deserves to die as part of the nation’s war on terrorism. Though Tsarnaev’s defense team has begun to present witnesses this week, Hoose predicts they may save most of their case for the penalty phase, when the jury will decide whether Tsarnaev is sentenced to death or life in prison. The defense team has not suggested in court that the Cambridge Rindge and Latin School graduate and former University of Massachusetts Dartmouth student had a serious mental illness, though they could easily raise some psychological conditions, such as depression or personality disorders, in the penalty phase as mitigating factors. Many death penalty cases involving young adults have included brain-science experts to discuss the evolving youthful brain, or the impact of trauma on the mind. So far, jurors have heard defense attorney Judy Clarke admit, in her opening statement, that Tsarnaev committed the crimes for which he has been charged and deserves to be held responsible, but that life in prison is the more appropriate punishment. She told jurors that Tsarnaev was going through an acutely stressful period before the 2013 Marathon bombings. Clarke told the jury that Tsarnaev’s parents had left the country, and Tsarnaev, then 19, felt the anguish of failing grades in college. She said Tsarnaev, “in one of those tough times of adolescence,” fell under the influence of his domineering older brother, Tamerlan, a former boxer who had already adopted jihadist views. The psychology of lone-wolf type terrorists is a new focus among terrorism specialists. Groups like Al Qaeda and the Islamic State have begun using online articles, songs, and videos to call for more lone acts of terrorism on the West, to more easily fly below the radar of government counterterrorism efforts. In an article about lone wolves in Foreign Policy called, “The Islamic State’s Irregulars,” J.M. Berger, a terrorism specialist with the Brookings Institution, a Washington, D.C. think tank, said many young adults are emotionally seduced by powerful jihadist material on the Internet that give some groups — like the Islamic State — the sheen of celebrity. Some terrorism specialists say the amount of mental instability is likely higher among lone-wolf terrorists than among those who join an organized terrorist group. Leaders of these groups — such as the late Osama bin Laden — tend to be on the alert for psychologically disturbed people who want to join their ranks, fearful their instability will undermine the security of their disciplined operations. Lone wolves are sometimes rejected by these groups. They say the degree of political, personal, and psychological factors motivating lone-wolf actors varies tremendously. “There are so many idiosyncratic pathways to terrorism,” said John Horgan, who specializes in the psychology of terrorists at the University of Massachusetts Lowell. In 2013, Horgan and his colleagues published a study, called “Bombing Alone,” which looked at the motivations and behaviors of 119 lone-actor terrorists, almost all male. Three out of four attended college, perhaps graduating and getting a higher degree. Despite this, the lone-wolf terrorists they studied appeared underemployed. Roughly 40 percent were not working, and 10 percent were students. The other half were working, though mainly in the service industry. Horgan said the research also showed that more than 80 percent of the terrorists they studied had made others aware of the political or ideological grievances that ultimately motivated their actions, and some 64 percent told family or friends of their intent to engage in terrorism-related activity. When looking at mental health, the study found that 32 percent had a history of mental illness or personality disorder. Ramon Spaaij of Victoria University in Melbourne, Australia, said he and a colleague recently completed a study of nearly 100 lone-wolf terrorists, and found social isolation to be a common theme. He said that roughly 40 percent of those he studied had a mental health issue. Frank Farley, a former president of the American Psychological Association who has studied terrorism, said he believes another quality can draw some people toward such action: A powerful thrill-seeking personality. He said they are the type to set a fire, then “watch the fire” and marvel at its creation. While many lone-wolf terrorists are socially isolated, Tsarnaev was not. After his arrest, he had many friends from college and high school describe him as a popular student who generously offered car rides to friends in his green Honda Civic and seemingly enjoyed being around people. He was a respected captain of the public high school’s wrestling team. They knew he was proud of his Chechen Muslim heritage, but they saw him as largely a secular person. Some longtime friends of Tsarnaev, however, have told the Globe that behind Tsarnaev’s friendly, low-key demeanor was a risk-taking side, sometimes accelerating his car to nearly 120 miles an hour, often with a lit cigarette in hand. They said he took in more than $1,000 a week in marijuana sales, and was seen at least once with a gun. He liked to play with BB guns and light fireworks. 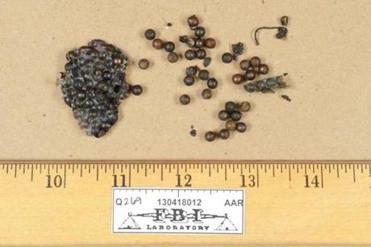 BB’s and fireworks played a role in the Boston Marathon bombing — and, in the prosecution’s eyes, in his role as a menacing lone-wolf terrorist. Hoose said Tsarnaev’s lawyers must try to present strong witnesses in the weeks ahead who can convince a jury that Tsarnaev is nothing more than a young impressionable teenager from Cambridge, who was desperate and troubled, and should not be executed. “They have to humanize their client,” Hoose said. Patricia Wen can be reached at patricia.wen@globe.com. Follow her on Twitter at @globepatty.